The Bookshelf would like to offer a HUGE thank you to all of you (vendors, sponsors, volunteers, and patrons) who stopped by our event on Saturday May 13th 🙂 We had over 300 people through the doors and a ton of fun to boot! 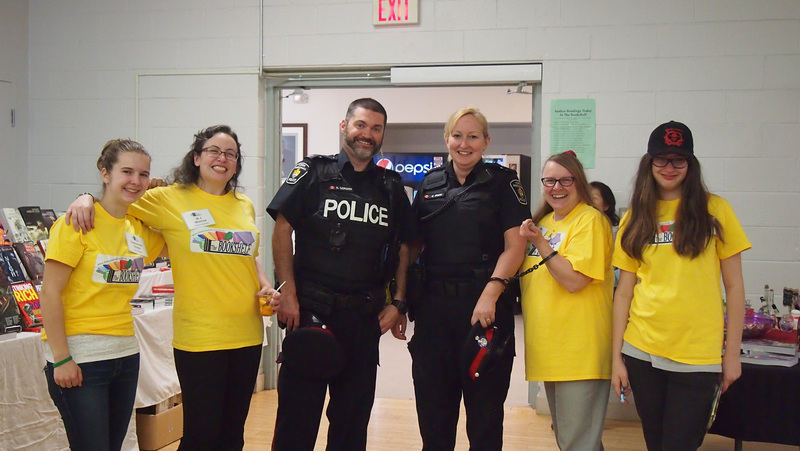 We had a fantastic time getting to know you, visiting with Elsa of York Region, Chase from PAW Patrol, Kids’ singer Marky Monday, and even the York Region Police! And without Karin’s Cafe helping run The Cafe at the End of the Universe, the day would not have been the same. 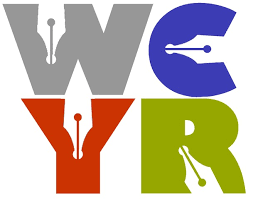 We couldn’t have made this event happen without the continued support of the Writers’ Community of York Region and all our behind-the-scenes planners. If you are interested in helping organize the 2018 event, please email MJ Moores at thebookshelf@wcyork.ca by June 9th, 2017. We are having a “post-mortem” meeting June 11th to discuss how this year went and how to integrate the suggestions we’ve received for next year. You do not need to attend this meeting, but if you are interested in helping out, it would be a bonus for us to know. The Hearts Linked by Courage series is an amazing collection of heartfelt, inspirational accounts of courage, surviving, and thriving after abuse, the loss of a loved one and more! These stories are meant to give you hope, and encouragement that inspires you to have faith, learn from your experiences, and be present and thankful every day regardless of what life throws at you. And when you’re in the depths of the “going through” phase, let these stories be a reminder there are better days ahead and there are many people who truly care. Click here to check out the first book in the Hearts Linked by Courage series, inspired and created by author and publisher, Sheri Andrunyk of I C Publishing. At I C Publishing we know the belief, commitment, and dedication it takes to create and tell a great story, and then bring it fully to fruition. Each and every project we accept is one we believe in. A number of us on the I C Publishing team are authors as well, and we’re all passionate about the written word. With each book we publish, there’s a process akin to birthing something new and amazing. It takes time and care, and the expertise of many, to produce a product we can all be proud of. With a minimum of two editors on each and every manuscript, a project coordinator, a designer or two, sometimes an illustrator, and production team, we embrace our role as publisher wholeheartedly and enthusiastically. In fact, we are almost as excited as the author when their book comes to life and it is ready to be released to the world. Be sure to stop by I C Publishing’s booth at The Bookshelf on May 13th, 2017 between 9am – 2pm to chat with several of the I C Authors about their books and their experience with this fantastic local publishing house. Hello York Region! So excited to attend The Bookshelf and meet you all. I write speculative fiction of all sorts. From my flagship supernatural thriller series Blood & Magic to a YA sci-fi fantasy Leia of Earth–stop by and I’ll match you up with a good book! Originally from London ON, I’ve lived all over this great country and love meeting new readers. I’ve worked in film, television, and theatre including backstage at the Stratford Festival, running my own screenwriting series, and performing at Fringes. I’ve also done a million odd jobs before turning to writing full time, from delivery driver to artists’ model to assistant parrot breeder. I’m also doing a new podcast called “Jen Frankel Reads Random S#it!” and co-host the Liquid Lunch talk show on ThatChannel.com. Come by the table and tell me your crazy story. You can take home a novel, or stock up on eBooks delivered right to your inbox for under $3 each. And don’t forget to ask me about the original Vegan Zombie, aka the Undead Redhead. Follow me on Twitter @jenfrankel and Instagram @jenfrankelauthor or find out more online at www.jenfrankel.com. Be sure to stop by The Bookshelf on Saturday May 13th Indoors @ the Newmarket Farmers Market, 200 Doug Duncan Drive anytime between 9am-2pm. Newmarket mystery author Cynthia St-Pierre is looking forward to meeting readers from across the GTA and beyond at The Bookshelf 2017 on Saturday May 13th from 9am-2pm. A member of Crime Writers of Canada, International Thriller Writers, and Short Mystery Fiction Society, Cynthia’s recipes and short stories appear in magazines and collections, including Harmoni, Feastie, Finding Vegan, Over My Dead Body!, Mystery Weekly and Flash Bang Mysteries. Awarded for fiction, she has also been a writing contest judge. Cynthia grows fruit and vegetables in her backyard, speaks English-accented French with her husband, Yves, and writes mystery novels with her friend Melodie Campbell. Come to The Bookshelf to pick up A Purse to Die For and A Killer Necklace! Studio Comix @ The Bookshelf! Stop by the Welcome Desk and receive a free comic book, participate in our free scavenger hunt draw, and potentially win a free prize just for checking out our giant book fair! James Linderman works at the jameslinderman music lesson studio in Newmarket, Ontario, Canada. He teaches guitar, piano, bass and music theory as well as contemporary songwriting and film composition, in studio, as well as over Skype to students all over the world. Song Forms is a new workbook has just been published that offers 100 song form templates to create new songs from. The workbook includes all of the support material a songwriter will require to easily understand how to use these templates quickly and effectively. Instructional videos as well as Skype sessions are also available to get the most out of using this essential resource. Each template page offers an analysis of the song form to help make the best decisions in each section of the song and each template also includes an optional assignment to help make songwriting a more focused pursuit. You will never have writer’s block again and your songs will be more plentiful and better than ever. This workbook will make 2017 a transformational year for your songwriting craft and career. Come meet James at THE BOOKSHELF on Saturday May 13th from 9am – 2pm in Newmarket at the Farmers Market – 200 Doug Duncan Drive. THE BOOKSHELF – Saturday May 13th, 2017 at the Newmarket Lions Community Centre — 200 Doug Duncan Drive. 9am-2pm. You can find Rod at the I C Publishing booth in the book room.